Moon River? No, It's An Ocean On One Of Jupiter's Moons! : The Two-Way Scientists announced in a NASA teleconference that the biggest moon in our solar system has a salty ocean hidden below its icy surface. 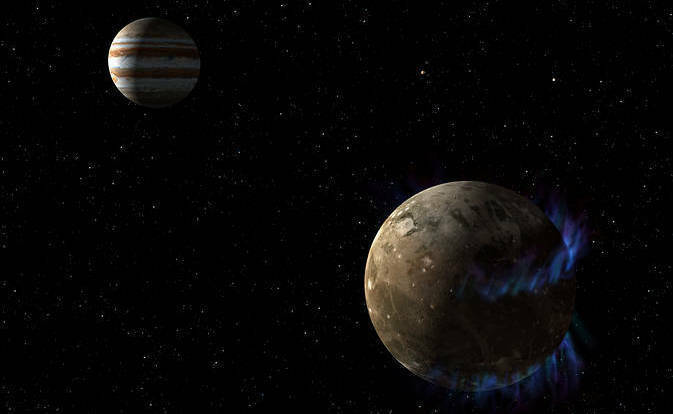 The moon Ganymede (right) orbits the giant planet Jupiter in this artist's rendering. Scientists say a saline ocean lurks under the moon's icy crust. NASA says the biggest moon in our solar system has a salty ocean below its surface. Researchers had suspected since the 1970s that a moon of Jupiter called Ganymede had an ocean. Now they've confirmed it, scientists announced in a teleconference held by the space agency. Ganymede was discovered by Galileo in 1610, and it's huge — bigger than our own moon, and even bigger than the smallest planet, Mercury. Ganymede has a magnetic field that creates northern and southern lights around its poles. A team of scientists led by Joachim Saur of the University of Cologne in Germany recently used the Hubble Space Telescope to spend hours watching these ribbons of hot, glowing gas. They saw patterns of movement that showed the moon's magnetic field is being influenced by a vast, salty ocean buried beneath miles of ice. The new observations "provide the best evidence to date for the existence of an ocean on Ganymede," Saur says. Our solar system has other moons with subsurface oceans, such as a moon of Jupiter called Europa and a moon of Saturn named Enceladus. Earlier this week, researchers announced that they'd found some compelling evidence that the water on Enceladus might be quite warm and comfortable. These alien worlds are all of great interest to scientists because liquid water is thought to be one of the key ingredients for life. "Every observation that we make, every mission that we send to various places in the solar system is just taking us one step further to finding that truly habitable environment, a water-rich environment," says Heidi Hammel, executive vice president of the Association of Universities for Research in Astronomy. "We will certainly be continuing to study Ganymede and learning more about the environment there." She notes that the European Space Agency is currently working on a mission called JUICE, a nickname for the Jupiter Icy Moons Explorer. The plan is for the spacecraft to arrive at Jupiter in 2030 and spend at least three years studying three large moons: Ganymede, Europa and Callisto.